Key paragraph of Turley's piece: "A good place to start would be with the federal law, specifically 18 U.S.C. 1503. The criminal code demands more than what Comey reportedly describes in his memo. There are dozens of different variations of obstruction charges ranging from threatening witnesses to influencing jurors. None would fit this case. That leaves the omnibus provision on attempts to interfere with the "due administration of justice." (Apparent) absence of judicial proceedings: Turley says that what Trump reportedly did was "wildly inappropriate," but he adds that "there is no indication of a grand jury proceeding at the time of the Valentine's Day meeting between Trump and Comey. Obstruction cases generally are built around judicial proceedings — not Oval Office meetings." The second must-read piece is an instant reaction to Comey's testimony today by the former FBI director's longtime friend Benjamin Wittes. Contrast between Obama and Trump: "Comey was so uncomfortable with Trump that he had already begun writing memos recording every interaction he had with the President and sharing them with the FBI's senior leadership." He didn't do that with Obama, whom he says he only spoke to twice. 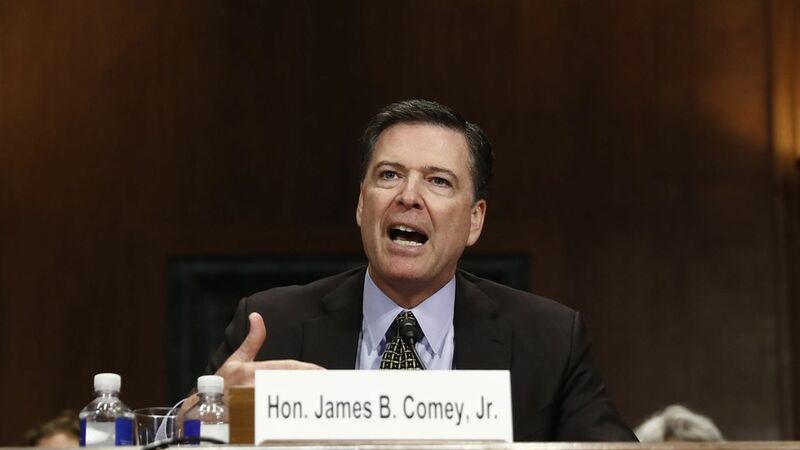 Between the lines: "Comey is saying here how little he trusted Trump from the beginning, and that Trump's behavior caused him to behave differently than he had in the past." Extremely inappropriate but not illegal: "It's hard to express to people who are not steeped in federal law enforcement just how inappropriate these inquiries are, particularly when they involve an investigation in which the President has such deep and multifaceted personal stakes. No, they are not illegal." Trump's awareness: "Ironically, the document makes perfectly clear that Trump was aware that the investigation was touching people close to him in the campaign and his company, and that he was perfectly willing throw these people under bus if need be. [Per Comey]: "The President went on to say that if there were some 'satellite' associates of his who did something wrong, it would be good to find that out, but that he hadn't done anything wrong and hoped I would find a way to get it out that we weren't investigating him."